The Star Fruit Kingdom is the sixteenth and final kingdom in Donkey Kong Jungle Beat and the fourth kingdom linked to the B Barrel. The kingdom is located in on an asteroid in outer space on an asteroid. In the original version of the game, it can be accessed by completing the Chili Pepper Kingdom and collecting forty-one Crests. In the New Play Control! version, it is accessed by obtaining three crests in the other three B Barrel kingdoms. As in all kingdoms, Donkey Kong eats a giant fruit at the end of every level here, particularly a star fruit. After defeating the world boss, Sumo Kong, and collecting 51 Crests, Donkey Kong is able to fight Ghastly King. Ninjape Rally is the first area of the Star Fruit Kingdom. 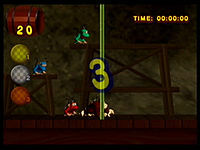 Being one of the very last levels in the game, it features many different obstacles and mechanisms that the Donkey Kong must quickly use to win a race against four Ninjapes. Two Jungle Buddies appear in the stage: Flurl and Helibirds. Helper Monkeys also help Donkey Kong in this level by tossing him to different areas. Other obstacles include ropes, falling rocks, and a small area of water that must be swum through. Although winning the race is optional, earning a better place in the race can give the Kong more beats to gather more Crests with. First place gives the ape 500 beats, second place awards him with 300, and third place awards him with 100. Any place before third, however, gives the ape no extra beats. Asteroid Belt is the second part of the Star Fruit Kingdom. This level takes place inside of many large, round asteroids in outer space. Dragon heads appear throughout the stage to transfer the Kong to different asteroids and planets. The interior of the asteroids are usually very dark, and their round surface make them harder to climb. At the end of the level, the Jungle Buddy, Hoofer appears, as well as the giant boss enemy, Iguanagon, who can optionally be fought. A Coco Pig can also be found in this level, and it throws coconuts at the ape from its palm tree. Other powerful enemies include a Dan Spider and two Rolling Frogs. After the ape bites into the star fruit at the end of this level, he heads to the battle against Sumo Kong. 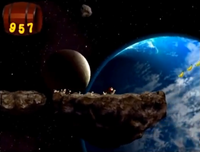 DK then faces Sumo Kong on a small rock near a planet. Sumo Kong attacks by attempting to slam his palms into DK. However, dodging is not done like usual; it is done by blocking each palm. Once a stalemate is reached, Sumo Kong is left open, and, once struck, can be punched several times, like the other bosses. Once he is defeated halfway, dodging is then possible, and the multi-hit attack is still possible. Once defeated, Sumo Kong will fall backward in defeat.